Isaac Technology has released a new surface cleaner which is friendly to the environment, is natural, fresh, and that leaves surfaces sparkling clean. This new product is thecitrus based K-51. 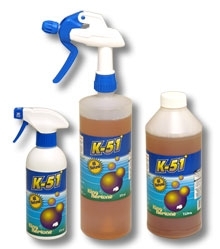 K-51 has been developed essentially as a cleanser for pool and spas, but because it is such a good cleanser it can be used around the house as well. It can be use on floors, kitchen bench tops, timber furniture, tiles, porcelain, chrome, metal, fibreglass, acrylic, glass surfaces, sinks & baths. It is simple to use, just spray on, spread with a cloth, leave for 30-60 seconds and then wipe or rinse off. As an introductory offer a bottle of K-51 will be given away with every Spa Kit sold. K-51 is sold in a 375ml trigger pack.